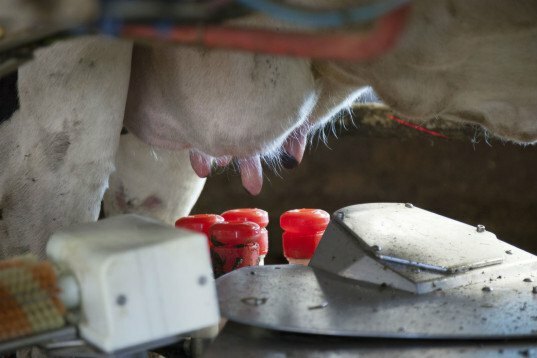 Dairy farming has a notoriously harsh impact on the environment; according the the World Wildlife Fund for Nature, around 270 million cows produce milk for a growing world population that is subsisting on an increasingly western diet. As cows break down plant material in their gut for nutrition, a fermentation process is triggered and methane is released—which has at least 25 times the global warming potential of carbon dioxide. And in order for cows to produce dairy, they must first become pregnant—in the vast majority of cases this is done through an imprecise process of artificial insemination, which means breeding huge cattle herds in order to meet demand. To address this, one group of researchers from the University of Nottingham has proposed treating cows with hormones so as they breed faster, while younger, allowing for smaller herds with a lower impact on global warming. But their proposal has raised some eyebrows. The research, which was recently published in PLoS ONE, simulated data for 10,000 herds of 200 cattle and predicted the daily possibility of conception from the start of the study up to day 300 of lactation, comparing traditional methods of insemination (done each time a cow is in heat), with targeted insemination triggered by the use of hormones. Specifically, they looked at the effects of Ovsynch, Ovsynch with progesterone, and Double prostaglandin. So while amending farming techniques to create lower levels of methane emissions is of significant import, it’s likely that there will be significant scrutiny of any efforts to add more hormones to the process, or to the food chain. In the meantime, there are other options; namely, a widespread reduction in the consumption of animal products, as several studies have called for.